You can add students one of three ways: in the app, on the website, or (if you have more than 30 students to enter) you can send us a spreadsheet of student/parent data and we will import it for you. 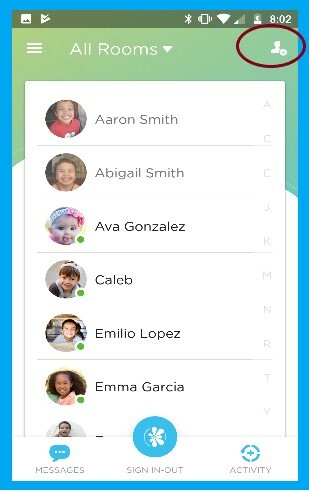 On the Home screen, use the add child icon (shown below). Enter the name of the child in "Tap to add student." Make sure the room is set correctly, as this will become the child's default room. Click on the child's name to edit their profile. Use the "+Add Parent" button or the "+Add Pickup" button to add to the child's authorized pickup list. Click on the student's name to edit and add tags. Note: Parents/Guardians will be issued a Sign In-Out pin and have access to the child's account to view daily activities or make online payments; the authorized pickups will only have a Sign In-Out pin with no access to child's information or payments. Go to My School --> Students. Use the "Add Student" button at the top right. After saving, click "Invite Parent" to add the first parent. If you add an email address, the parent will receive an email right away with information about how to sign up for their parent account, unless you uncheck "Email will be sent automatically." Back at the list of names, you can then click "Add Parent" or click on the child's name to add more parents or authorized pickups on the child's profile. Edit the profile to capture any other information including Tags, Notes, and Allergies. If you are adding a child who is a sibling to an existing child, click here for details on how to add or link siblings.